In Germany Piñatas are not very well-known. 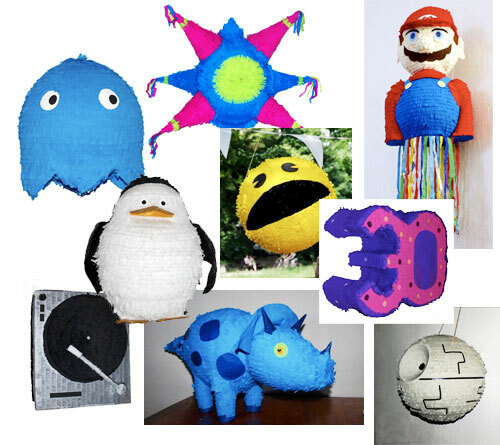 In Spain and Latin America, Piñatas however are quite popular as they make a perfect gift/game for any birthday or a house party. Made of paper-mache, they are usually filled with sweets (or whatever you wish) and during the party the blindfolded guests, usually after being spun around a few times, hit the Piñata one by one with a stick until it breaks open and all the goodies spill out. Kids and adults alike love this game! (Adults especially when tipsy) You can make them yourself or get them from Stefanie who creates wonderful Piñatas in Berlin upon request in any shape or form. Alternatively check out Berlinpiñatas at Nowkoelln Flowmarkt. Price around 20-40€. (funny Youtube clip).